Reduces visible signs of premature aging, such as sun damage, brown spots, visible veins, discoloration, and fine lines and wrinkles. The treatment is powered by Intense Pulsed Light (IPL) with SmartPulse™ technology that delivers precise light through several layers of skin. This generates heat when absorbed by the targeted tissue, which corrects imperfections in the skin without damaging any of the surrounding tissue. A real-time cooling system works to keep your skin protected throughout treatment. How Does IPL Photofacial Work? IPL Photofacial is Intense Pulsed Light that emits multiple wavelengths into the skin and effectively targets pigment producing cells below the surface of the skin. The light energy is converted to heat energy and destroys the hyperactive melanin producing cells in the layers of your skin, eventually dispersing pigmented areas. The spots are pulled to the surface, eventually turning into a coffee-ground-like texture that eventually flakes off revealing beautiful, radiant skin beneath. Who Is/Is Not a Good Candidate for IPL Photofacial? Those with a higher Fitzpatrick score, those with a tan and those with melasma are not good candidates. Because the light rays are attracted to pigment, darker skin tones can actually become discolored and melasma patches can become darker. How Many IPL Photofacial Treatments Do I need? For best results, 3-6 treatments are typically recommended, about four weeks apart. 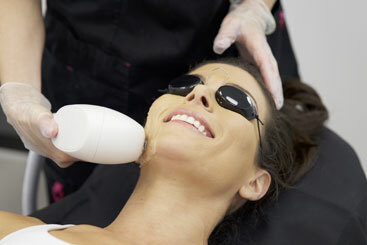 Photofacial would not necessarily be called painful, but it can be a a little uncomfortable. Patients liken the feeling to a rubber band snapping on their skin. The light from the laser is also quite bright, which may be uncomfortable for some with light sensitivity. How Long Do IPL Photofacial Results Last? Photofacial results perpetually improve over time, with best results being seen three months after the last treatment. Sun protection and skin care maintenance are essential to the longevity of the results. Sunburns and over exposure will bring back old spots and freckles and dullness will return if proper exfoliation during daily routines are neglected. A new series of treatments are recommended every year for optimal results. Where Treatment Areas Are Best For IPL ? Venus Versa Wrinkle Reduction Treatments use energy delivered through a combination of Multi-Polar Radio Frequency and Pulsed Electro Magnetic Fields to produce uniform heat under the skin’s surface. This process helps to naturally increase collagen and elastin fibers, resulting in firmer, smoother skin that looks noticeably more youthful. Venus Versa™ is transforming hair removal by using Intense Pulsed Light (IPL) with SmartPulse technology to reduce unwanted hair on the face and body. The treatment works by delivering energy to the deeper layers of the skin to target the hair pigment and destroy the follicle.